It’s estimated that a whopping 800 plastic bottles are used every minute in the UK! And of these only 57% are currently recycled, leaving the rest to end up in landfill, burned for energy or even as litter on our beaches. To reduce the production of single use plastic water bottles the ReFILL scheme encourages people to refill their bottles with tap water rather than buying a new bottle; a more sustainable and cost effective solution. But did you know that 70% of people are put off asking a café or restaurant for a tap water refill out of a simple fear of asking? The LOVEmyBEACH coordinators and an army of beach loving volunteers work hard to combat this here in the North West, making the act of refilling when out and about easy, social and rewarding. ReFILL volunteers contact cafes, bars and restaurants with one simple ask; display the ReFILL sticker clearly in shop window showing support for the campaign. The participating locations are then logged on the Refill app so wherever you are in the UK you can find the nearest venue to refill your bottle for free. Grab your bottle and start refilling today! If you run a local business and would like to sign up, or if you are a member of the community who would like to volunteer their time to sign up more businesses, then please contact us here for more information. The Refill campaign was created by Keep Britain Tidy’s BeachCare programme in Cornwall but has grown thanks to City To Sea. For more information on the campaign please visit their website here. 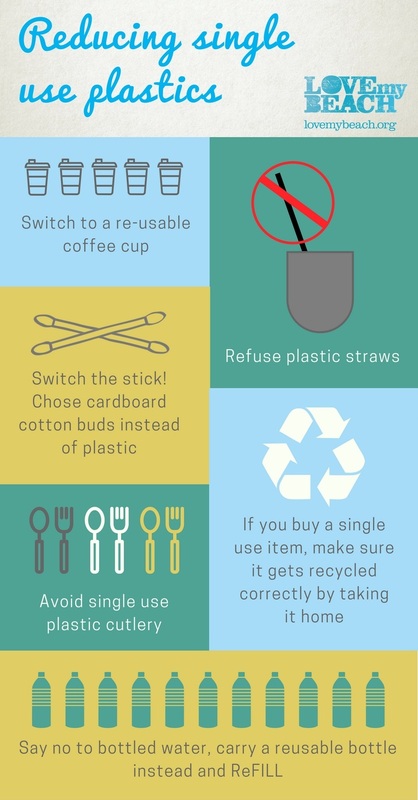 Reduce use of single use plastics such as plastic bags, cutlery & food packaging. That there will be more waste plastic in the sea than fish by 2050 if we don't take action NOW!